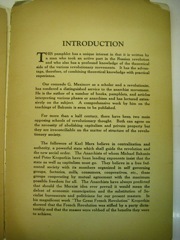 This pamphlet has a unique interest in that it is written by a man who took an active part in the Russian revolution and who also has a profound knowledge of the theoretical side of the various revolutionary movements. It has the advantage, therefore, of combining theoretical knowledge with practical experience. Our comrade G. Maximov as a scholar and a revolutionist, has rendered a distinguished service to the anarchist movement. He is the author of a number of books, pamphlets, and articles interpreting various phases or anarchism and has lectured extensively on the subject. 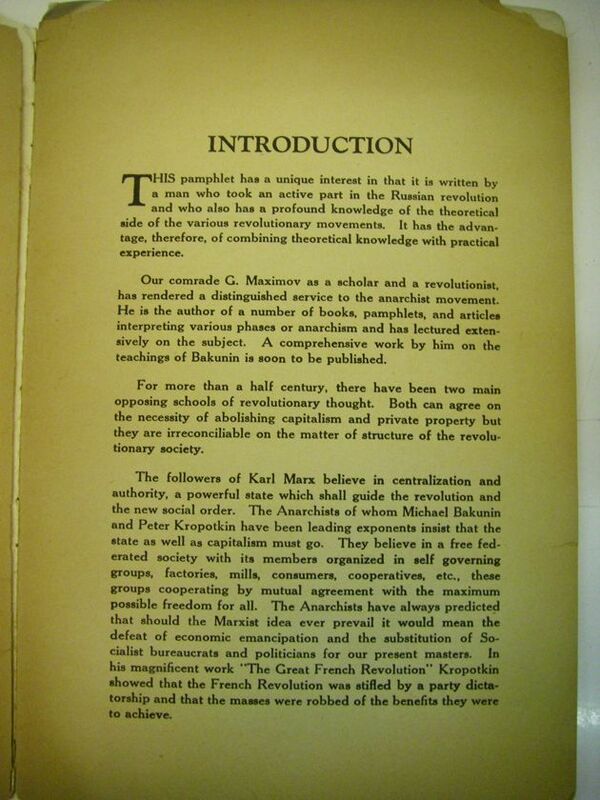 A comprehensive work by him on the teachings of Bakunin is soon to be published. For more than a half century, there have been two main opposing schools of revolutionary thought. Both can agree on the necessity of abolishing capitalism and private property but they are irreconcilable on the matter of structure of the revolutionary society. The followers of Karl Marx believe in centralization and authority, a powerful state which shall guide the revolution and the new social order. The Anarchists of whom Michael Bakunin and Peter Kropotkin have been leading exponents insist that the state as well as capitalism must go. They believe in a free federated society with its members organized in self governing groups, factories, mills, consumers, cooperatives, etc., these groups cooperating by mutual agreement with the maximum possible freedom for all. The Anarchists have always predicted that should the Marxist idea ever prevail it would mean the defeat of economic emancipation and the substitution of Socialist bureaucrats and politicians for our present masters. In his magnificent work "The Great French Revolution" Kropotkin showed that the French Revolution was stifled by a party dictatorship and that the masses were robbed of the benefits they were to achieve.